Containment Protocols: RPC-745 is to be contained within Flat Jason Island, an uninhabited island within the Falkland Islands archipelago. The island has been placed under Authority jurisdiction, and has been designated OL-Site-745. MST Sierra-9 "Falklanders" has been assigned to keep RPC-745 contained. In order to take advantage of RPC-745's "protective" properties, all Sierra-9 personnel have been issued Argentine military uniforms from the Falklands war. Civilians are to be directed away from the island, citing "munitions disposal." Description: RPC-745 appears to be an articulate mannequin, however, X-ray scanning has shown that RPC-745 is a complex automaton, constructed out of what appears to be steel, with an outer layer made of kevlar. RPC-745 has a manufacturing date listed on the back of its neck, displaying the date of 18/12/1980. RPC-745 is sapient, and is capable of fluent speech, perceiving sights and sounds, and fluid movement. RPC-745 requires no power source to function. RPC-745 refers to itself as "Colonel Agustín Garcia Manzanedo." RPC-745 believes itself to be a member of the Argentine Army, although no records of its existence are found within the records of the Argentinian Defense Ministry. RPC-745 is fluent in the Latin American dialect of Spanish, and possess a basic understanding of the English language. RPC-745 is passive in most situations, and is even stated to be "friendly" by OL-Site-745 Personnel. RPC-745 is noted to be extremely hostile towards English personnel, but under a set of "conditions," these being that the individual must be wearing a British military uniform circa 1982, and the individual must be carrying firearms. All conditions must be met in order for RPC-745 to attack an individual. RPC-745 is also noted to protect all Argentinan personnel from what it perceives as "harm'. 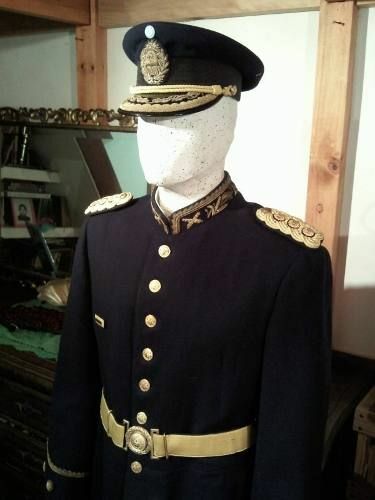 RPC-745 is noted to follow orders from Argentinian personnel if they are wearing an Argentinian military uniform displaying any rank above Colonel. This behavioral pattern also applies to recordings of Argentinian military personnel above the rank of Colonel from any time period. It is unknown how RPC-745 identifies the ranking of personnel from these recordings. Discovery: RPC-745 was discovered on 31/5/1982 during the Skirmish at Top Malo House on Mount Simon island in the Falklands archipelago. During the skirmish, Argentine Forces observed RPC-745 attacking British forces. Upon Argentinian victory in the skirmish, RPC-745 was noted as “celebrating” by Argentine Private Sergio Martinez.1 On 1/6/1982, the Argentinian government contacted the Authority about RPC-745. RPC-745 was then recovered, with all surviving combatants being administered amnestics. Results: RPC-745 was seen raising its rifle. RPC-745 then fired a round into the head of the English CSD before putting the rifle down. RPC-745 then attempted to communicate with the remaining CSD. After proving to be unsuccessful, RPC-745 left the area. Procedure: Researcher Álvarez was given an Argentine General's uniform for this test. RPC-745 was issued the same Argentine military FN FAL from the previous test, but with only one round of ammunition. A single CSD personnel meeting all requirements for RPC-745's hostility was brought into OL-Site-745. Álvarez then told RPC-745 to capture the CSD instead rather than kill him. Results: RPC-745 raised its rifle towards the CSD, but did not fire. Instead, RPC-745 proceeded to disarm and restrain the CSD, which it then brought to Researcher Álvarez. RPC-745 proceeded to salute Álvarez before returning to its regular activities. The CSD was then sent back to Site-002. Procedure: A doctored recording of deceased Argentinian dictator Juan Perón was created, giving directions to kill two CSD personnel, one meeting all requirements for RPC-745's hostility, and the other being dressed in Argentinian uniform with an unloaded rifle. As with the previous tests, RPC-745 was issued an Argentine military pattern FN FAL rifle with the magazine containing two rounds. Results: RPC-745 raised its rifle to the head of the English CSD first, quickly firing the first round. RPC-745 then focused its rifle on the Argentinian CSD, with the recording still playing. RPC-745 then asked the Argentinian CSD if he was "truly a traitor to Argentina" three times. Upon the CSD giving a reply of no three times, RPC-745 shot the speaker playing the recording. RPC-745 then left the area, returning to its normal activities. Researcher Álvarez, surprised by the results of the third test log, requested that he interview RPC-745. after receiving approval from Head Researcher Hidalgo, Álvarez had directed RPC-745 to a modified Standard humanoid containment cell equipped with cameras and microphones. Foreword: The following is the Interview between Researcher Álvarez and RPC-745, recorded at OL-Site 745. Due to the interview taking place in Spanish, it has been translated into English. Álvarez: “As is protocol, I am to ask what you would like to be addressed by. Your designation is RPC-745, and that is the default, but you also go by Colonel Manzanedo." RPC-745: "Come on, Álvarez. You're a friend and a fellow patriot. Just call me Agustín." Álvarez: "Alright, Agustín. You claim to be a serviceman. An eternal force for Argentina. So, why did you disobey the recording? Perón gave you orders." Álvarez: "I see. But then again, you did kill the Englishman from the same orders." RPC-745: "Great Britain is the enemy of Argentina. They stole our Malvinas. I only kill them because we are at war. To this day, they still occupy these beautiful islands." Álvarez: "I understand now. You are a patriot to your country. You don't kill based purely on nationality, but out of servitude." RPC-745: "Correct. I hate taking human life, but it is a necessity for my country. A necessity I am willing to fight for." Álvarez: "Agustín, Are you aware that the Falklands war ended in 1982?" RPC-745: "That is a funny joke, Álvarez. The war is not over. I will always fight to claim the Malvinas. It is our rightful territory." RPC-745 proceeded to leave the interview cell, returning to its regular activities as usual. Álvarez proceeded to listen to the recording of the interview and then sent it to Site-002 for archival purposes. It would be another day of this war as usual, hadn't it been for one event. When we were fighting the English, some thing wearing our uniform helped us. It called itself Colonel Agustín Garcia Manzanedo. Looked like something out of a low-budget science fiction propaganda piece. Hell, Galtieri will probably steal this idea. After it helped us fight off the British, it celebrated its victory with us. It was rather nice to us. We were not freaked out after the skirmish, knowing that machine was on our side. Hell, Diego even made friends with the thing. Whoever reads this is going to think I am crazy. -Private Sergio Martinez, Argentinian Army.